Do you want to be freaking out, while trying not to slide down a nearly vertical rock, passing under a massive stone, stuck between the tallest sides of this very same rock? I know you do! Once we reached Karadjov Stone we were surprised at first. The initial view is of this massive rock which seems completely impregnable. I would love to say it gets better afterwards, but it really doesn’t. Once we went closer, we realized that the way to the top is nearly vertical and there is a wooden ladder, hand crafted by somebody God knows when. I remember Hugues (or someone else from our group) wondering when was the last time the ladder was checked by the authorities. I laughed – let’s leave it at that. WARNING: When we went to Karadjov Stone, we saw a snake. Don’t let this discourage you, but wear woolen socks – this will protect you in case you meet a “sister”. If you listen to my advice here, you won’t have a single problem (the snake we saw was a tiny one). Other than that, once up you will be stunned. 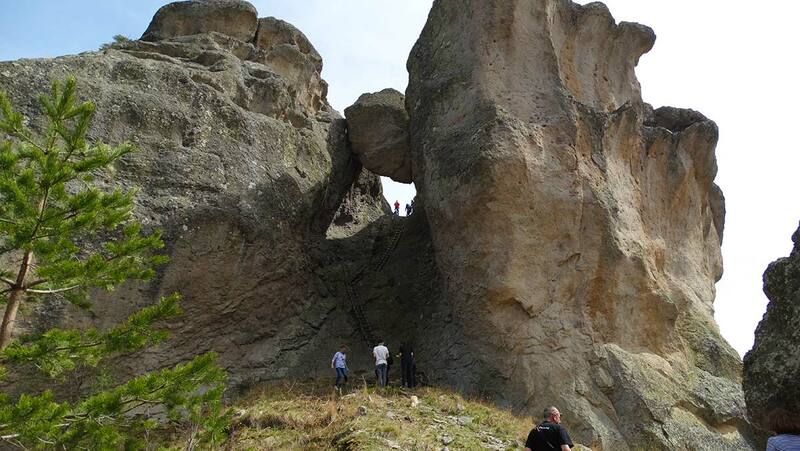 Karadjov Stone offers a 360 degrees view of the Rhodope mountain and it is insanely beautiful. We rushed a little and went before summer had arrived, yet the open space and the beauty of the mountain were breathtaking. Even considering all the challenges we faced getting there, I would still recommend it. Like this? Check out our guide to Prohodna Cave (The Eyes of God Cave) – one of Bulgaria’s absolute must-sees! As a part of the energy triangle of the Balkans, you can see both the Cross Forest and Belintash from there. Historically, Karadjov Stone has been a sacred place even for the Thracians (Bulgarian ancestors) – 6th-7th Century BC. This basically tells you that the hanging-in-mid-air stone has been there quite a while and is probably not falling any time soon. According to the legend that Julia from Time2Travel tells, Karadjov Stone played an important role during the times of the Ottoman Empire as well. It is believed that Karadja, a local insurgent who took care of protecting his compatriots in the area, was murdered on Karadjov Stone. His murder came after he singlehandedly killed 24 out of 25 Turkish occupiers who were responsible for the death of a young girl. The place was then named after him. Another legend talks about a large treasure which he hid somewhere in this area. Don’t go looking for it though – the treasure is cursed and will only bring pain to those who find it. So, if you are looking for an experience that is both spiritual and adventurous, pack your bags and head off to the Rhodope Mountain. You can learn more about our entire trip (day by day) here. Hi Paul! Will certainly do 🙂 Had no idea you’ve entered the travellers biz world! Looking forward to going on a tour with you! Wow, these really are some wow views! Going up the Karadjov Stone looks like a scary piece of experience! Brave girls!